Digital collage artwork Limited edition prints (4/50)Classic Australian fun in the bush with native Australian wildlife. Personified rainbow Lorikeets, kookaburras and a sulfa crested Cockatoo. Detailed pencil artworks are drawn on paper and then scanned and digitally collaged with some of my Australian photography. Digital collage artwork Limited edition prints (4/50)Classic Australian fun in the bush with native Australian wildlife. Personified Kingfisher and a sulfa crested Cockatoo. Detailed pencil artworks are drawn on paper and then scanned and digitally collaged with some of my Australian photography. Digital collage artwork Limited edition prints (4/50)Classic Australian fun in the bush with native Australian wildlife. Personified rainbow Lorikeets, Magpie and a sulfa crested Cockatoo. Detailed pencil artworks are drawn on paper and then scanned and digitally collaged with some of my Australian photography. Digital collage artwork Limited edition prints (4/50)Classic Australian fun in the bush with native Australian wildlife. Personified Tawny Frog-mouth, Ibis and a sulfa crested Cockatoo. Detailed pencil artworks are drawn on paper and then scanned and digitally collaged with some of my Australian photography. Digital collage artwork Limited edition prints (4/50)Classic Australian fun in the bush with native Australian wildlife. Personified kookaburra, rainbow Lorikeets and a sulfa crested Cockatoo. Detailed pencil artworks are drawn on paper and then scanned and digitally collaged with some of my Australian photography. Digital collage artwork Limited edition prints (4/50)Classic Australian fun in the bush with native Australian wildlife. Personified rainbow Lorikeets, kookaburra, Kingfisher, Ibis, Galah, Magpie, Tawny Frog-mouth, Grey Kite bird, Honey eater and a sulfa crested Cockatoo. 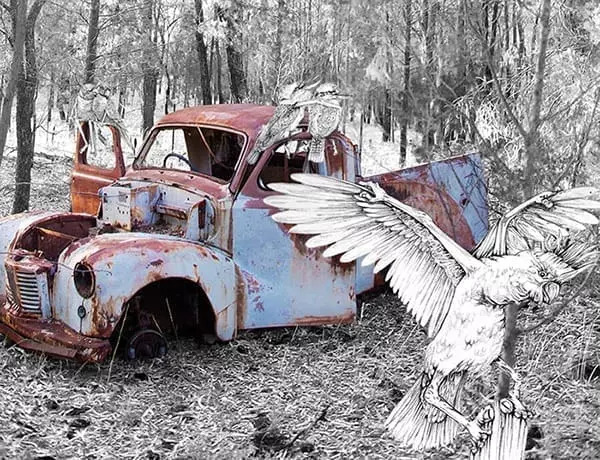 Detailed pencil artworks are drawn on paper and then scanned and digitally collaged with some of my Australian photography.